Harira, considered the national soup of Morocco, is a healthy, yet satisfying combination of tomatoes, chickpeas, lentils, and pasta. 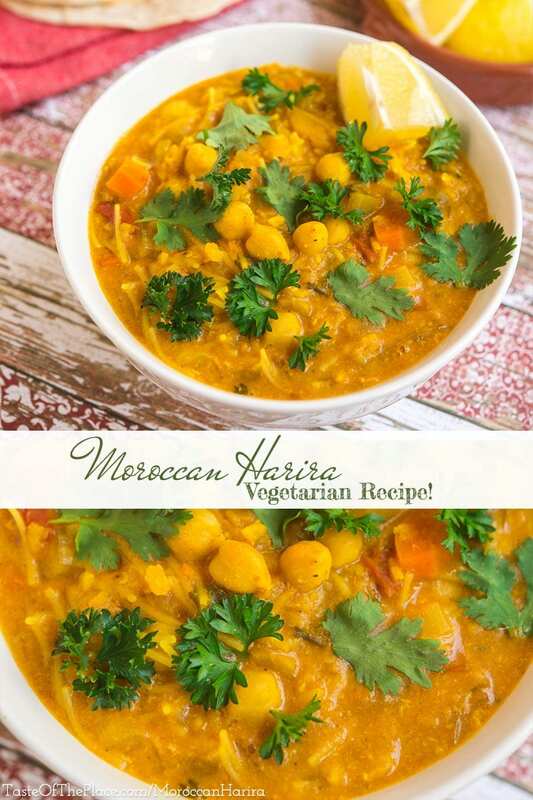 This vegetarian version is generously seasoned with aromatic flavors like saffron, turmeric, and fresh cilantro, and will leave your kitchen scented with the magical aromas of Morocco. It’s no surprise that one of my favorite world cuisines is Moroccan. The spice blends, generous use of fresh herbs, loads of veggies, savory meats, and the beautifully balanced fusion of the many food cultures that have influenced the area come together to make Moroccan food both magical and memorable. This Moroccan soup, called harira, is a perfect example of what makes Moroccan food so special. It is satisfying yet light, and wonderfully spiced yet well balanced. Harira is a healthy combination of tomatoes and chickpeas thickened with lentils and pasta, and generously spiced with the aromatic flavors of Morocco. It is considered the national soup of Morocco, although it has been enjoyed for centuries throughout the greater Maghreb region of North Africa. With ancient and mysterious roots, it is one of those wonderful, traditional dishes that varies greatly from family to family and region to region. Harira is often eaten to break the daily fast during the month of Ramadan in Muslim cultures, and is usually enjoyed with dates and sweet cakes or cookies. I can completely understand why this soup would be so loved to break a fast – it’s loaded with goodies – pasta, legumes, veggies, and egg and meat if you like, plus it is savory and zingy, and happens to be easy on the tummy. A winner all around! Although a Ramadan tradition, this dish is loved by many throughout the world, and can be eaten any time of year. Many versions of harira call for meat, especially lamb, but I wanted a lighter, more summery veggie soup. But don’t let that make you think this soup isn’t satisfying. The chickpeas, lentils, and vermicelli all serve to thicken things up, and turn the harira into a meal. So what about the egg? When I was researching harira, I was surprised to see eggs in so many of the versions. Some recipes call for whisking the egg with lemon juice before adding, while others call for simply drizzling beaten egg into the finished soup. The egg serves to thicken the harira, as well as add additional protein – a good thing if you are embarking on a fast like Muslims do during the month of Ramadan. I personally like the additional texture and interest the egg adds to the finished dish. If you would like a vegan harira, simply omit the egg. Easy! While this recipe calls for a lot of ingredients – especially spices – it really is quite easy to make. The secret is to have everything ready to go before you start cooking – chop all the veggies, measure out and sort through the lentils, measure all the spices, and then relax and enjoy cooking! Like most soups, harira gets better the next day. Don’t be afraid to make a big batch so you can have leftovers. It will likely be quite thick on the second day – just loosen it with a bit of water while you reheat it, and it will be absolutely delicious! To make harira into a meal, serve it with fresh bread, perhaps a simple salad, and dried dates. While serving something sweet, like dried dates, with a savory soup might seem odd to many of our Western palates – I recommend giving it a try. 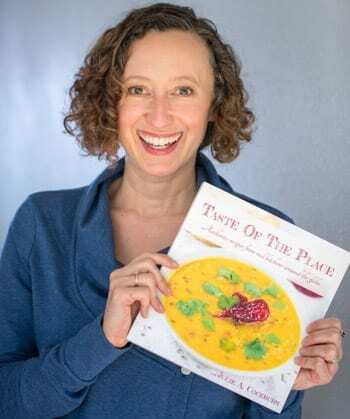 It beautifully balances the flavors – tempering some of the sharper spices and bringing out the earthier nuances, and adds that memorable bit of Moroccan magic that we all love so much! Harira, considered the national soup of Morocco, is a healthy, yet satisfying, combination of tomatoes, chickpeas, lentils, and pasta. 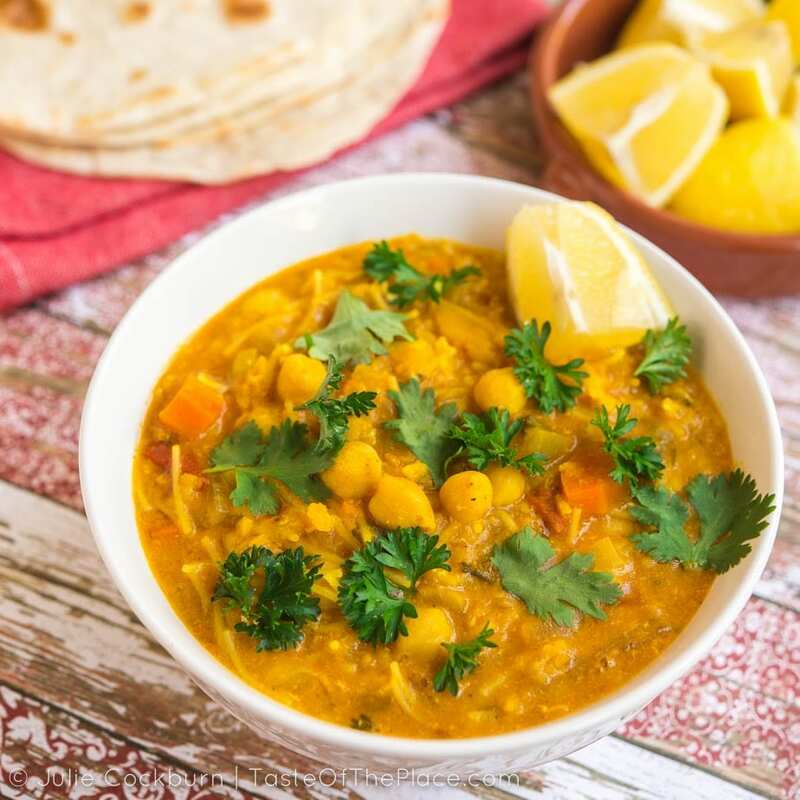 This vegetarian version is generously seasoned with aromatic flavors like saffron, turmeric, and fresh cilantro, and will leave your kitchen scented with the magical aromas of Morocco. Heat the olive oil in a large soup pot or Dutch oven over medium-high heat until the oil becomes fragrant and begins to shimmer in the pot. Add the onion, celery, carrots, and a big pinch of salt (Do be mindful of your salt - if your veggie stock is particularly salty, you may just want to add a small pinch at this point. You can always add more later.) and cook, stirring frequently, until the veggies soften and just begin to brown. Stir in the garlic, turmeric, cumin, ginger, a generous grind of black pepper, and red pepper flakes to taste. Stir constantly until everything is very fragrant, about 30 seconds. Stir in the diced tomatoes, along with the saffron, parsley, and cilantro. Continue cooking, stirring frequently, for 5 minutes. Add in the vegetable stock, and stir well. If using dried and soaked chickpeas, add to the pot, bring to a boil, then reduce to a simmer. Simmer uncovered for 25 minutes, or until the chickpeas are just tender. If using canned chickpeas, add them to the pot, skip the 25 minutes cooking, and proceed immediately to the next step. Stir in the dried red lentils, bring to a boil, then reduce to a simmer. Cook uncovered until the lentils and chickpeas are tender, 10 to 20 minutes. Keep an eye on the pot, and add more liquid if it is looking dry or sticky. Stir in the vermicelli, and cook until tender, about 3 minutes. At this point, the harira should be quite thick and hearty, but not dry or sticky. Add additional liquid if you want a thinner, soupier texture. Stirring constantly, slowly drizzle in the beaten egg, creating whisps of cooked egg throughout the soup. Remove immediately from the heat. Stir in the juice of half a lemon, then give the harira a taste, adding additional salt or pepper if needed. Garnish the harira with cilantro and parsley leaves, a drizzle of extra virgin olive oil, and a pinch of flakey sea salt. Serve with bowls of lemon wedges and dried dates on the side. Like most traditional soup recipes, there are about a bazillion versions of harira. Many versions call for meat, especially lamb, but for my recipe I wanted a lighter, more summery veggie soup. The egg is a commonly added ingredient, and boosts the protein, but can be easily omitted for a vegan soup. Harira is all about the spices. Use the best quality, freshest spices you can, and ideally grind the cumin and black pepper just before using. Look for saffron threads that are fragrant and deeply colored, and simply crush them lightly between your fingers as you add them to the pot. I can practically guarantee that your house will smell amazing! Savory Spice is my favorite place to purchase high quality spices. You can visit their online shop at TasteOfThePlace.com/SavorySpice. Expect the finished texture of your harira to be quite hearty and thick, but not dry or sticky. If you want a thinner, broth-y soup, simply add more liquid at the end of cooking. While serving something sweet - like dried dates - with a savory soup, may seem odd - I recommend you give it a try. It beautifully balances the flavors - tempering some of the sharper spices and bringing out the earthier nuances, and adds that memorable bit of Moroccan magic that we all love so much! Speaking of serving - in my humble opinion, it is the final touches that take a soup from good to great. Don’t skip the sprinkling of fresh herbs, drizzle of oil, pinch of flakey sea salt, or that last minute squeeze of lemon juice. It’s these extra little touches at the end that really make this soup sparkle. In my opinion, this recipe isn’t complete without a sprinkle of flakey sea salt at the table. I keep a special, exceptional quality, flakey sea salt in my pantry to use just as a finishing salt. I put a pinch on soups, sprinkle on bread and butter, over pasta, and even onto chocolate and caramel for a delicious, mineral-y flavor and delicate crunch. Love it! The brand I use is Le Saunier de Camargue Fleur de Sel, and you can pick up a box HERE at Amazon. It’s a bit pricey, but a little goes a long way – especially if you just use it as a finishing salt like I do. Harira is all about the spices! My absolute favorite spice source is Savory Spice. Click HERE to visit their online shop, or click the links in the recipe to be taken directly to those specific spices.